Our Winemaker, Peter Devison, is named a Winemaker to Watch. The aromas of embers, black pepper, dark fruit, herbs, smoke and spice are brooding and locked up on first pour, showing more on each swirl. The blue and black-fruit flavors are ripe, sweet and full, with savory notes fleshing out the crazy long finish. Aromas of iron, olive, herb, smoke, orange peel and savory notes are followed by a ripe, full savory palate that packs a punch. It’s far from shy but manages to keep it all in balance. This blend of Mourvèdre (78%) and Grenache is a very pretty pale peach color. Aged in a mixture of concrete, stainless steel and neutral French oak, it suggests aromas of citrus, strawberry, herb and spice. It tingles the palate with fresh, lively flavors, showing poise and presence with a citrus-filled finish that lingers. Typically the most forward of the winery’s offerings, this wine brings aromas of blue fruit along with notes of fire pit, olive, mineral and cured meat that become more prominent over time. The blue and black-fruit flavors are dense and focused, with a firm backbone of tannins providing support. It needs time in the cellar to stretch its legs. The white-pepper, garrigue, raspberry, orange-peel and pot-roast aromas pop. The palate is action packed with raspberry and cranberry flavors that lead to a long, savory finish. This thoroughly delicious, acid-driven wine opens with aromas of passion fruit, oyster shell, herbs, wet stone and citrus. The flavors are sleek yet generous with electric, mouthwatering acidity. It demands oysters alongside it. The aromas of ripe peach, jasmine, honeysuckle and mineral pop. It drinks just off dry, with a spritz of stone-fruit and citrus flavors that extend on the finish. Seeing just a kiss of new oak (20%), this wine offers brooding aromas of spice, white flowers, tropical fruit and citrus. The palate is full of white-grapefruit flavors backed by a zing of tart acidity, with barrel spice flavors lingering on the finish. It shows a lot of tension. 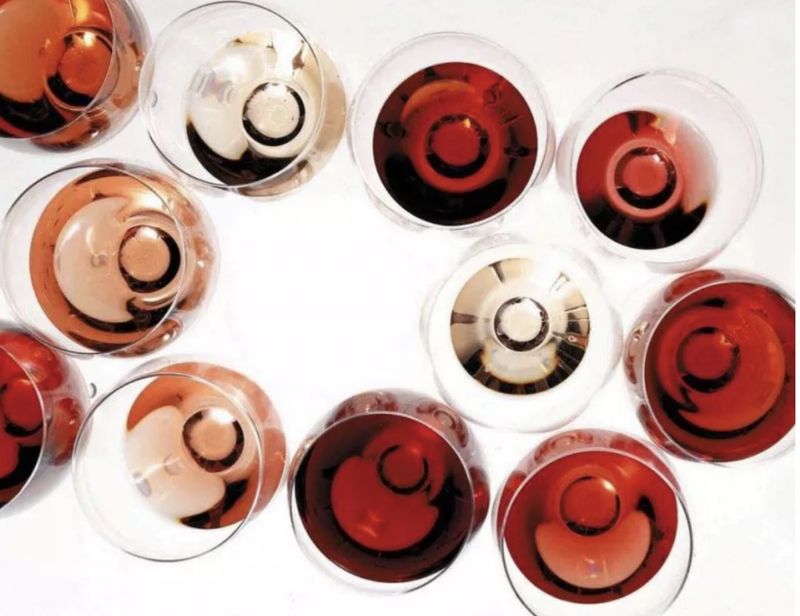 “Summer’s Best Rosés” include Oldfield Estate Rosé with the highest rating of the New World selections. In “Washington Wines to Uncork This Spring” Paul Zitarelli recommends the best wines for springtime including our Feral Sauvignon Blanc. Final Final has been selected as a finalist in Vivino’s 2016 Wine Style Awards by more than 13 million wine drinkers. This is an honor bestowed on less than one percent of the 100,000 wineries on Vivino. 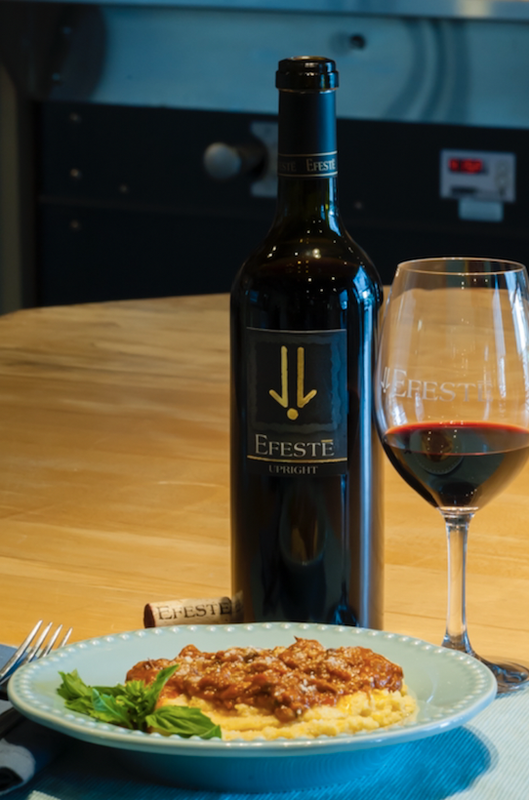 EFESTE is named among The Best Wineries in Woodinville. Washington State AVA Map courtesy of Washington State Wine. The 2012 Final Final is named a “Top Red Blend” and declared “Excellent” by the tasting panel. 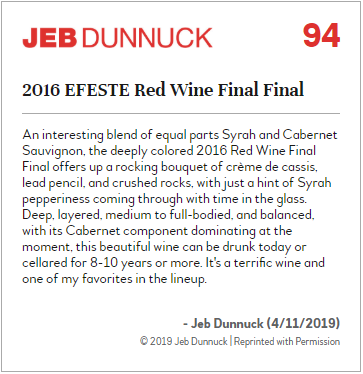 EFESTE 2012 Final Final, Columbia Valley • $30 Winemaker Peter Devison leaned heavily on Cabernet Sauvignon and Syrah for this delicious blend from Woodinville. Aromas of mint, cherry and spicy oak lead to flavors of black raspberry, blueberry and dark chocolate. It’s all backed by firm tannins that balance all the fruit. Sourced from old blocks at the Klipsun, Bacchus, Red Willow and Kiona vineyards, this 100% Cabernet exhibits a deep ruby color and bold aromas of blackberry, old tree cherry, Damson plum, attar of rose, pipe tobacco and incense. The flavors mirror the aromatics with full bodied red and black fruits that are imbued with licorice, Swiss chocolate, Sumatra roast and alluvial minerals. The saturation continues on the back with roasted berries and nuts, mocha, toffee, graphite and fine grained integrated oak (80% new French for 22 months), followed by a long, authoritative ripe tannin finish. If you like a bold, solid Cabernet, this is for you. Brilliant crimson-ruby colored, this 88% Mourvèdre/12% Grenache blend possesses a seductive spiced, smoky nose of blackberry, pomegranate, cassis, crushed roses, garrigue and incense. The flavors mirror the aromatics with black and blue fruits that are intermixed with cocoa, Sumatra roast, and Wahluke scorched earth. The back picks up macerated berries, roasted nuts, crème de cassis and charcoal on the way to a lengthy ripe tannin finish. Deep crimson colored, this Syrah emits intoxicating aromas of blackberry, mountain blueberry, black currants, garrigue (lavender and Provençal herbs), tobacco and incense. On the palate, the black and blue flavors are mouth encompassing, intermixed with licorice, cocoa powder, French roast and gravel and loam minerals. The back reveals sensations of pressed berries, roasted walnuts, crème de cassis, kidskin and charcoal, followed by a long, ripe chewy tannin finish. 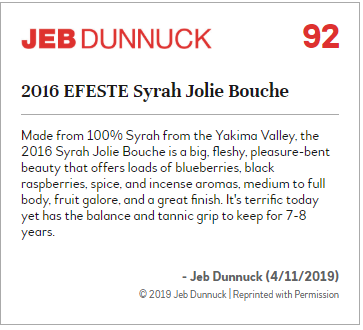 Kristen Oliveri names EFESTĒ among 10 Undiscovered Wineries in Washington State to visit next time you’re in wine country. “This exuberant wine has aromas of raspberry jam, thyme, orange peel, earth, iron and olive. It’s rich and intensely flavorful, with waves of mouthwatering fruit and savory notes that lead to an extended finish.” —S.S. “Still in its shell, this wine reveals aromas of violets, black licorice, tar, crushed granite and dark fruit with a bit of coaxing in the glass. 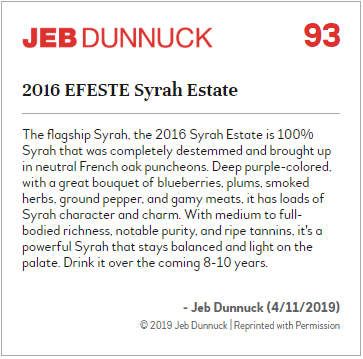 It’s full bodied, with tart, tangy fruit flavors that need time to stretch their legs.” — S.S.
“Mourvèdre (81%) makes up the majority of this blend with Grenache (12%) and Syrah filling it out. It leans into savory notes, with aromas of sage, dried herbs, white pepper and mineral. The flavors are plush and palate-coating, bringing a slightly tacky feel that softens over time. ” — S.S. This offers a surprisingly savory look at this sun-drenched appellation, with aromas of smoke, mineral and Kalamata olives. The cherry flavors are full bodied with a palate-coating, slightly tacky feel that smooths out over time. A lively offering—it practically screams out for oysters—this wine brings aromas of talc, flowers and white and pink grapefruit. It’s fleshy in feel, with racy, puckering acidity that draws out the finish. This warm-vintage wine is aromatically generous with notes of toast, lemon, citrus oil and guava. It’s light yet rich, with a plush feel and a tart finish. In “Northwest Wine: Merlot remains a star in Washington wineries” by Eric Degerman and Andy Perdue, Great Northwest Wine writes that Wine Press Northwest magazine recently conducted a tasting of 100 Northwest Merlots for its spring issue. The 2012 Upright Merlot is named as a top wine from the judging. This is the first vintage of this wine to include estate fruit, along with fruit from Klipsun, Bacchus and Red Willow. A complex medley of herb and spice aromas accented by purple flowers is followed by bold yet still refined dark-fruit flavors that linger on the finish. It has the tannin to go the distance. Merlot makes up half of this wine, with the balance Cabernet Sauvignon (40%) and Cabernet Franc. It announces itself with nuanced aromas of herb, dried leaves and flowers, along with black currant. The flavors are palate coating and textured, showing depth but also restraint. The aromas bring a big whack of pungent blue and purple fruit, along with notes of herb and cherry. The flavors are full and palate coating, bringing a real sense of texture and hedonism but still with great freshness. The aromas of mineral, spice, toast, yellow apple and lemon pith are light but enchanting. The palate is medium bodied and refined, demonstrating judicious use of oak and a lengthy finish that shows some warmth. The 2013 Estate Petit Verdot from Taylor Mag Vineyard receives a rating of “Excellent”. “EFESTĒ winemaker, Peter Devison, is producing beautifully handcrafted wines, using minimalist Old World winemaking techniques, to include native fermentation and limited oxygenation. 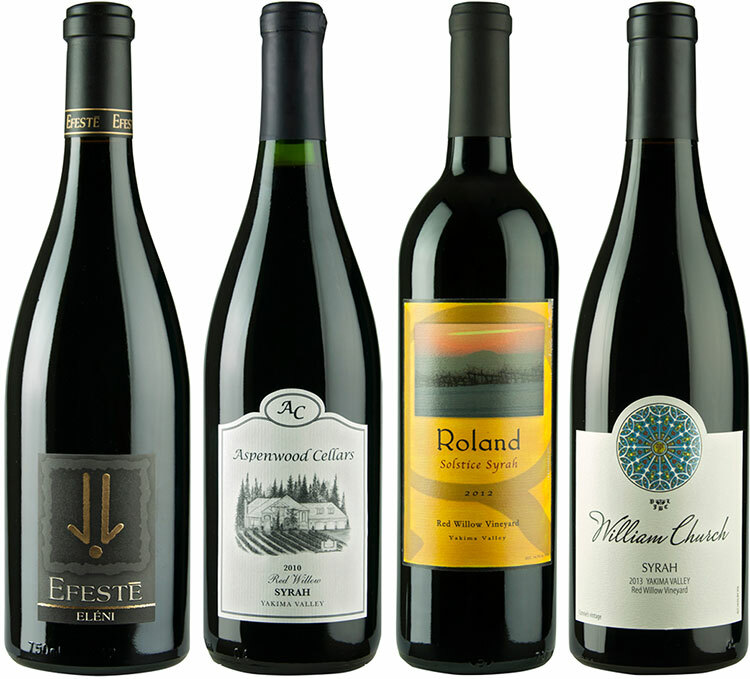 His bold reds, such as Cabernet Sauvignon, Syrah, and Petit Verdot, are velvety, complex, and have lots of fruit-laced layers.” Excerpted from Wining About in Woodinville. 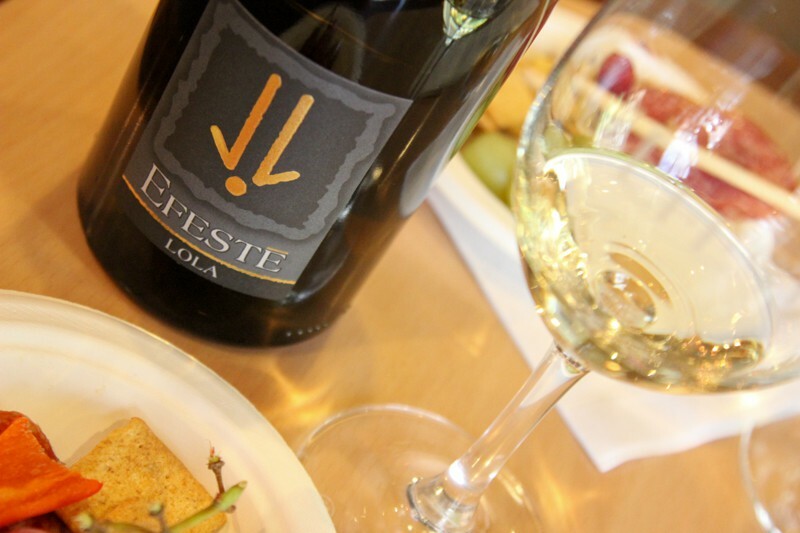 EFESTĒ is featured in Top Washington State Wine Clubs Worth Joining. 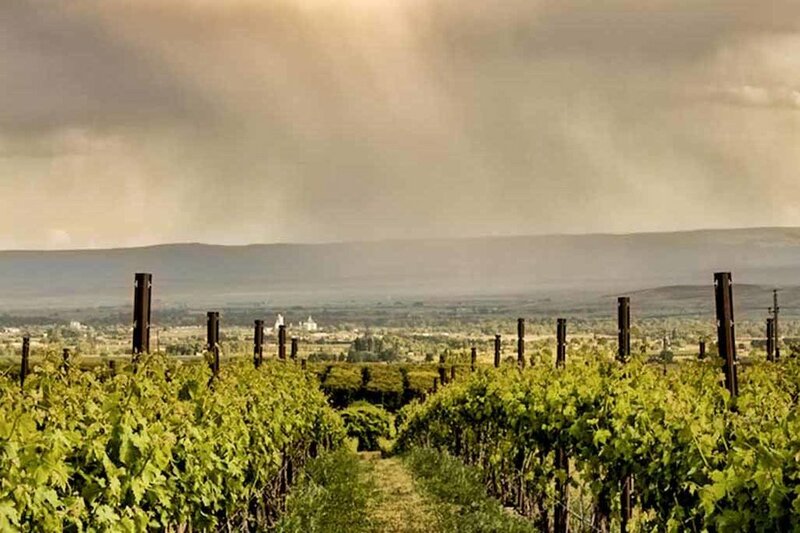 Zach Geballe names 10 Wines Perfectly Paired with Summer including our Feral Sauvignon Blanc. All varietal, this wine is mostly Klipsun and Bacchus vineyards, with Kiona and Red Willow rounding it out. 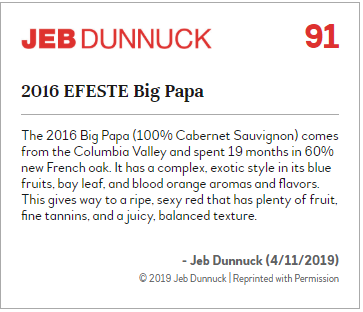 The aromas bring immediate appeal, with pure notes of black cherry, fresh and dried savory herbs and crushed granite, showing pleasing complexities. The palate is tightly wound, showing a fine sense of depth that is balanced by bright acid and firm tannins. The finish lingers. It’s a compelling example of the variety. This wine entices with its nuanced aromas of mineral, spice, almond butter, lemon pith, tropical fruit and chamomile. The flavors are concentrated while still showing exquisite restraint along with pitch-perfect balance. The extended finish kicks it up a notch. Cabernet makes up just over half of this blend. Aromas of black cherries, herbs and minerals are followed by plush-feeling dark-fruit flavors and backed by firm tannins. Drink now. Via “Washington Turns up the Heat” by Stephen Tanzer (subscription required). 2013 Evergreen Riesling is named one of the Top 100 Wines for 2015 giving it the distinction of being the only white wine from Washington State on the list.